Home Features Thailand GP: Who Impressed? The GP of Thailand took place at the weekend, it was a very tough GP due to the heat and track but gatedrop will look at some of the riders that impressed at the second round of the championship! Pauls Jonass made a bit of history in Thailand as he is the first Latvian to have a GP podium, he was very impressive all weekend and doing his country proud! He didn’t seem to let the heat affect him that much which was a big help this weekend as the heat and humid conditions were rash. Pauls was solid in the first moto with a fourth and finishes a comfortable second in the next moto. He said on the podium that he came into the season with no expectations…. Only two rounds gone and a podium already, surely he will expect a lot more podiums now. He is certainly putting himself as a contender to be a future world championship in MX2, the future is bright for the Latvian! The humidity and heat definitely suited Thomas Convington more than the GP riders but even he said “the heat was brutal here. On another level of heat and humidity compared to Loretta’s”, so that just shows how tough it was! Thomas was solid all weekend and got two fifth places in the moto’s on Sunday, definitely a more solid start to the season than last year. If he can keep this speed up and stay consistent he could definitely end the season in the top 10 of the championship which will be pleasing for him. I feel like Valentin Guillod has went under the radar this season but he was riding with Thailand an illness, not the best conditions never mind being ill as well. He managed to get two sixth places for a fifth overall and is fifth in the championship. He says that he “wants to find a better feeling with the bike”, he will be the man to watch when the series comes back to Europe, I feel he could definitely challenge for podiums and the fact that he’s already fifth in the championship shows better things could be ahead! British fans had something to cheer about as Mel Pocock managed a sixth overall which is very impressive for him. Unfortunately his team mate Max Anstie was out for the weekend so it was up to Mel to shine for Steve Dixon’s camp and that’s exactly what he done. Mel really struggled on the KTM last year so it is nice to see he still has the speed to get some top 10s in what will be his last year in MX2, Thailand was differently one of the best GP’s he’s ever had, if not then it’s been his best! After Qatar’s huge disappointment for Ryan Villopoto he bounced back in style and looked really comfortable on the track all weekend, he was by far the fastest rider up until that second moto were he had nothing for Cairoli or Desalle. However, he has his first GP win of the year in only his second ever GP, that didn’t take long! The question is how many more can he win? The last American to win a GP was Zach Osborne in 2009 so it’s a big achievement but not exactly a surprise to see RV winning so soon; it is going to be an amazing fight for the title! 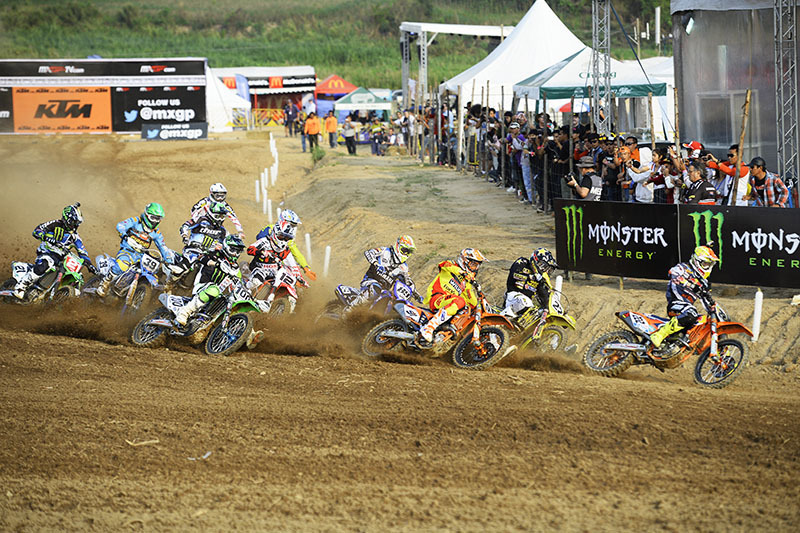 Honestly, Antonio Cairoli was off the pace all weekend and then got the holeshot and there you go, the rest is history as he cruised to victory! You just can never rule out the eight times world championship no matter what the conditions are, it was not a track he particularly enjoyed riding but still came away with a moto win and did well to salvage fifth in the first moto. Cairoli said after the podium “I am not in top condition yet and for sure I will improve”, that’s a warning for just about anyone behind that gate! The moto win was massive, he didn’t want to give RV anymore confidence and he certainly didn’t. How consistent has Clement Desalle been this year? Everyone is talking about RV and Cairoli while Desalle has had an awesome start to the season and looks incredibly smooth, he has the red plate but how long will he be able to keep it? I have to admit that I was surprised that he was able to beat RV in the second moto, a lot of confidence for the Belgian and you couldn’t half tell, never seen him so happy on the podium before! The rookie of the class, Romain Febvre even better this week! It’s awesome seeing him so suited to the 450 Yamaha, he looks so smooth and in control, a totally different rider to what we seen in MX2 last year were he was crashing a lot! Romain was close to his first ever overall podium in only his second GP, how long will it be until he gets it? If he had of gotten a better start in the second moto it was definitely possible this weekend as he had the speed for sure. Todd Waters really impressed me this weekend with an eighth overall, obviously the heat wouldn’t have fazed him as much as the other GP riders and the track suited his style but he rode really well. He’s ninth in the championship after two rounds, if he can stay consistent and finish in the top ten in the championship that would be a good season for him as the class is stacked. It will be interesting to see how he can do at the European GP’s and adapt to the different conditions!